When Rick Danko, Levon Helm, Garth Hudson, Richard Manuel, and Robbie Robertson first started playing together, they weren't playing in a band of their own, but rather, as sidemen for various artists, including Ronnie Hawkins, Cathy Smith, Sonny Boy Williamson, and most notably Bob Dylan. Then, once they branched out on their own, they found themselves without a name. 'Levon and the Hawks' didn't stick. For a while they were The Honkies, and then The Crackers — thankfully, neither of those made the cut either. Finally, Robbie Robertson noted that Dylan always had just referred to them as, "the band." Since their lineup was the same, minus one Robert Zimmerman, why not just go by that? In November of 2001, I was working on an off-Broadway show in New York called Roadside, written by Tom Jones and Harvey Schmidt, the same songwriting team that gave us The Fantasticks. The show was structured in the manner of a country revival tent, with a central storyline revolving around a jailbreak, the theft of some oats, and a Texas marriage. The big production number was a countrified ditty called Smellamagoody Perfume. Needless to say, I didn't have high hopes for a Fantasticks-like run of success. But the good news was, they let me do the orchestrations and hire the band. Since it was a small pit, I knew I would need versatile players. Specifically, I was looking for someone who could cover mandolin, guitar, and some banjo parts. At a loss, and still relatively new to the New York music scene, I relied on my old teacher from my Berklee days, Matt Glaser, to recommend someone, and his first thought was to give Barry Mitterhoff a call. Barry was already pretty well known to me, though not personally just yet. I think I remember my reaction at the time as being something along the lines of, "Well, jeez, do you think he'd actually do it?" He did, and thus I entered Mandolin 101 with Professor Mitterhoff. Sitting next to him for eight shows a week was about as immersive a learning experience as any young mandolin student could possibly hope for. Every day, I learned something new about the history and the technique of the instrument. Sensing an eagerness to soak up whatever I could glean from him, he started bringing in recordings of mandolinists from all around the world. India, Brazil, Europe, and even some obscure American folk and bluegrass players, which I pored through with a zealot's devotion. All of this he did without prompting or remuneration. It's just the kind of thing Barry does for people. Ask anyone who knows him, and they'll tell you the same. The show might not have been that good, but I wouldn't have traded those few months for the world. Listen while you read - Barry's original composition Lily and Maya from the Silk City recording Time, 2000. Joe Brent: Thanks so much for taking the time to talk with us, and of course it's always wonderful for me personally to get a chance to talk with you, Barry! Joe Brent: I'm very sorry to hear that. Wish I could get something a little more aesthetically pleasing up there. Joe Brent: It's been a while! Barry Mitterhoff: It has been a while. Joe Brent: When was the last time? I guess the last time we were together was when we played with Carlo in '05, or maybe even before then. Barry Mitterhoff: Oh, that was in New Jersey somewhere. Joe Brent: Yeah, you were the one who first told me to seek him out. Can't tell you how much I appreciate that. Joe Brent: So, let's get started! Most people who read Mandolin Cafe are familiar with you and your playing, but for those who aren't, perhaps as we did in the Carlo interview, could you tell us a little about your background, and how you got started playing the mandolin? Barry Mitterhoff: Oh sure. I actually was introduced to the mandolin by a relative also, at quite a young age, though not as young an age as Carlo. I started playing guitar like most kids my age, and I became so interested in it that my aunt gave me a mandolin. She said, "Well, you like the guitar, maybe you'll like mandolin too." Her name was Sylvia Rubin, and she had played in a mandolin orchestra in Newark, New Jersey, and it was an orchestra that had been formed around a political group, like many of the orchestras in those days, and this was a Jewish, left-wing organization that had a young orchestra for kids so they could learn theory, and the history, and a little bit about the instrument. So she played in this orchestra in the 1940s, and when she gave it up as an adult she had an instrument lying around and she gave it to me, and said, "Maybe you'll enjoy playing this." So that's how I got started and I'm forever grateful to her for that. Joe Brent: A Jewish, left-wing mandolin orchestra!? Barry Mitterhoff: Well, the fact of the matter, Joe, is that a lot of the orchestras back in the old days, back in the 20s and 30s were part of civic groups and social groups, and there was a Friday night mandolin orchestra that had to do with a newspaper that came out, and I can't remember the name of the group in Newark, but there was a political group that sponsored these orchestras just to give their kids some culture at a bargain rate. Joe Brent: (laughs) Wow, that's a part of the history of the instrument in America with which I'm totally unfamiliar. What kind of repertoire would they be doing? From 1991, Barry Mitterhoff's mandolin recording Silk City. Barry Mitterhoff: They actually did light classical, and some folk music as well. They had a kid who played the recorder, and his father was the conductor. Joe Brent: So when you were learning to play, did you study with someone or were you pretty much on your own? Barry Mitterhoff: When I first started I was on my own, just playing folk music and jump band music, and there was some music around that had some mandolin on it that I tried to replicate, then later when I got serious, about the age of 16, I did seek out a teacher through my family, through a friend of my parents that had a son who was a serious bluegrass musician. His name was Bob Applebaum. He gave me a total of four lessons some time back when I was in high school. In addition to the tunes he taught me, he also exposed me to the music of Bill Monroe and The Country Gentlemen. And if you think bluegrass is obscure now, imagine how obscure it was in New Jersey back in the late 1960s. Tony Trischka & Skyline on Fire On The Mountain, circa early 1980s. Barry Mitterhoff, mandolin; Larry Cohen, bass; Dede Wyland, guitar; Danny Weiss, guitar; Tony Trischka, banjo. Joe Brent: Going back and listening to some of the Skyline stuff, it seems that by the time you had joined that band, you already had a fully-formed, mature style. Barry Mitterhoff: I guess it was fully-formed by then. I improved over the course of that band, but before that I had played in a couple of other bands that sent me in the direction of bluegrass, newgrass and beyond. I was listening to jazz, I was listening to rock and roll, and that kind of thing. The recording Fire of Grace, circa 1990. Tony Trischka, banjo; Barry Mitterhoff, mandolin; Danny Weiss, guitar; Rachel Kalem, vocals; Larry Cohen, bass. Joe Brent: Speaking of Skyline, this is a group that a lot of people that read Mandolin Cafe are really big fans of, and they're known as the precursor of a lot of the newgrass stuff that's going on now. But when I listen to it — tell me if I'm way off here — but it seems to me like it's a reaction to a lot of the things that were going on in rock and jazz at the time. I'm thinking specifically of Mahavishnu and Weather Report, where you were working within forms and structures that had been around for a while, but you were very free within the forms, incorporating collective improvisational sections that were integral parts of the form, but in a much more free way than had really been done before. Was that the intention of the group from the beginning or was it something that just evolved? Barry Mitterhoff: I think that's very perceptive and accurate. We were out to use bluegrass instruments, and also use a fair amount of bluegrass vocabulary, but just stretch it with a lot of improvisation. And also, a lot of that music with Tony Trischka and Skyline was orchestrated in a string band sense, in that there was a lot of emphasis put on people playing parts and not just playing rhythm and lead. There were a lot of sections in the songs that had been orchestrated within an inch of their lives. Part of the thing in Skyline was taking some classical pieces and making bluegrass out of them. It sounds a little cheesy now, we did this piece by Dvorak, Five Bagatelles For String Trio and Harmonium and we made it kind of a Bill Monroe-feeling piece, orchestrated from a lot of the original string parts. Joe Brent: It's amazing to listen to now, especially in light of what's been going on in the newgrass scene recently. Barry Mitterhoff: I think that bluegrass was moving on... we weren't the precursors of it but we were definitely members of the club. We hoped to take it further, and we saw it as a really valid and useful form. I think it was definitely ahead of its time. A lot of the stuff that we did is being done more now, and is a little more common among some of the younger players. Joe Brent: Listening to it now, amongst improvisers, Bill Evans gets a lot of the credit for popularizing collective improvisation within a modern context, but how much of what you guys were doing was about an intentional direction towards collective improvisation and how much of it stemmed from the rapport you had with the individual members of the band? Barry Mitterhoff: Well, we were together for ten years and several records, so after a couple of years we did feel very comfortable with each other. Tony already had a reputation for stretching the boundaries of bluegrass and we used that. We experimented with some space stuff, and sort of made noise with our instruments, and that was looked upon as strange for a bluegrass band in 1982. Joe Brent: It's not strange anymore. Joe Brent: And that's a good thing, I think! (laughter) Sort of a little bit of a tangent, I'm looking at some of the names in the group, I see names like Weiss and Cohen and Mitterhoff, and you mentioned Bob Applebaum, and I think of names like Grisman and Statman and Glaser. I'm just curious, what is it that makes nice Jewish boys like us turn to bluegrass? Barry Mitterhoff: Well, I couldn't really answer that question... all I know is that when I was starting to play, I looked up to a lot of the New York figures, and there were a certain number of Jews as well as non-Jews. I think there's a lot of soul in the music and it attracted a lot of like-minded people. I play the in a band now called the Klezmer Mountain Boys which plays bluegrass and klezmer music next to each other and lets you draw your own conclusions. It's definitely two forms of music that go nicely together. Barry Mitterhoff with the Klezmer Mountain Boys: Margot Leverett, clarinet; Kenny Kosek, fiddle; Marty Confurius, bass; Joe Selly, guitar; Aaron Flagg, trumpet; Don Mulvaney, drums. Joe Brent: It seems to me that the future of modern music, regardless of genre, is going to be about the blending of various musical styles. It's not so much about breaking down harmonic language or structural forms. I see a lot of the music that you were doing and the stuff that's happening now, and it has a place both in clubs, or porches, as well as on stage at Carnegie Hall. Barry Mitterhoff: I think you're right. As people get exposure to a lot of various kinds of music without getting freaked out by blending, say, a gypsy jazz band or by combining Brazilian music with other kinds of music, I think it's natural. It has to do a lot with the players. I think of myself coming up as a bluegrass player but I almost immediately went in other directions to play a little bit of classical music, Brazilian music, Jewish music... I don't think it's as unusual now as it was before, to go in different directions, and show different sides of your playing. Joe Brent: I think it's fantastic, and a lot of the musicians that I'm most interested in now, certainly you, and a lot of other players, are seeking to add colors to their palette, not just in instrumentation and different voices in the band, but also differing harmonic languages from other kinds of music from around the world. Barry Mitterhoff: As you get exposed to all this music, it just comes out in your playing. It's a great thing, it really adds to the development of music. Joe Brent: On that same point, coming from a bluegrass background, being fluent in that harmonic language, but I know you're very conversant in a lot of other kinds of musical language. You mentioned jazz, and I know you know a lot about Brazilian music. I think you were the one who introduced me to U. Srinivas and Jacob do Bandolim's music. So I can't thank you enough for that! Barry Mitterhoff: That's some really amazing stuff. That had quite an impact on me when I was first turned on to it. I'm not a full-time choro player or anything like that, but it definitely colors everything I do. I recorded a choro pretty early on, on a record called Rounder Banjo Extravaganza. It wasn't a real authentic version of it, but I think it was one of the first choros recorded as far as the guys up here. Joe Brent: Your current project that you are the most involved with these days, I guess, is playing with Jorma Kaukonen, touring as Hot Tuna. First of all, could you just explain how you met him and got involved with his music? Barry Mitterhoff: Sure. I've actually played with three different versions of that group; I play in duo contexts with Jorma and myself, we're just about to go play some shows in Japan and some shows in China next week. I also play with Hot Tuna as an acoustic trio, which is the two of us with Jack Cassidy, who's an amazing voice on the electric bass. And then occasionally we play with drums as well, and I take out my electric mandolins and I play with those. The way I started with them is Jorma made a CD back in 2002 called Blue Country Heart where he played old-time country tunes and country blues tunes. He recorded the album in Nashville and he used the Nashville guys, Bela Fleck, Sam Bush, Jerry Douglas, and Byron House, and he used a trio to back him up when he went out to promote that album and I ended up joining that trio. I've been with him ever since. Clockwise from top-left: Jorma Kaukonen, guitars; Jack Casady, electric bass; Skoota Warner, percussion; Barry Mitterhoff, mandolins. Photo credit: Scotty Hall. Joe Brent: It goes along with a lot of what we've been talking about already. Jorma is a guy who's known as a terrific fingerstyle guitar player, coming out of Reverend Gary Davis, but there are certainly a lot of different flavors that are in his playing as well, so I can imagine how your voices would be very sympathetic to each other. Barry Mitterhoff: We're really a nice fit, the two of us, we both have a real tie to the tradition and yet we like to take chances with it and try something new. You're right, his mentor was Reverend Gary Davis, but he never went out of his way to duplicate those recordings, he plays in his own way. He adds a little bit of jazz to it, and playing with me, I add a little bit. Joe Brent: I love hearing that mix of voices. One of the common themes in the conversations that I've had so far doing these interviews with Mandolin Cafe is that every player ends up being their own stream, breaking off from a river, which then breaks off into smaller streams. Barry Mitterhoff: Of course. You got it. Joe Brent: So your influences are coming from all these different directions, but you in turn have also influenced many other players that have picked up a little bit of your language. Hot Tuna performed Hesitation Blues on Minnesota Public Radio's Midmorning. Barry Mitterhoff: It's hard to tell how that works. I teach a lot, so there's that... so, you just put it out there and you see. There's definitely a thing that I started playing, and other players. Each has their own ability on the mandolin, and it's almost taken for granted now. Joe Brent: Are there any of the younger players that have come on the scene since you first started that have really caught your ear? Barry Mitterhoff: Oh, I like a lot of the younger players. Joe Walsh has subbed for me in the Klezmer Mountain Boys; we haven't done much playing together but I like his approach to the mandolin. Of course Chris Thile and Sierra Hull and players like that. I like the ones who push the boundaries a little bit and are not afraid to play some new notes. I say, keep on playing those new notes! So that's what I look for in a player, and also those with a sense of the tradition. Joe Brent: And those players in turn will influence players down the line. 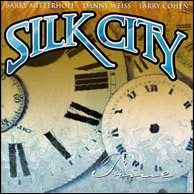 Barry's band with Danny Weiss and Larry Cohen, Silk City, from 2000. Click to purchase. Joe Brent: I wonder if you wouldn't mind talking a bit about technique. I know you're a very active teacher as well. Your right hand technique is very distinctive: I notice that when you switch from chord accompaniment to single-note lines, you plant your right hand right there on the body of the instrument, and the effect is that when I watch you play, it looks like your right hand is barely moving, and I have to say I'm very jealous of how effortlessly you're able to do that. Is that something you've always done, or is that something you learned from someone? Barry Mitterhoff: No, it's just something I picked up on my own, and when I teach new students, I don't necessarily even advocate that they play exactly like that. I tell them they can try to put their palm over the bridge, or they can try to lightly put their fingers on the top of the neck. I think it's just something that I came up with that helped me play faster and lighter and with more precision. I think again that the outlook on that has changed. Back in the day, it was frowned upon a little bit more to touch the top of the mandolin with your hand. There are some great players out there who also brace their hands on the instrument. It's starting to get a little bit more accepted. I think everybody has to try to find out what works the best for them. Joe Brent: More so than any other instrument, I find that because we mandolinists don't have the weight of hundreds of years of history weighing down on us, telling us that there's a right and a wrong way to do things, you find a lot of really terrific players, all playing with very unique approaches, and all of them very good. So it's impossible to look at someone like you, or whoever, and say that one is doing it right and one is doing it wrong because the end result for so many of these wonderful players is great. How can you argue with it? Barry Mitterhoff: You can't. You're right, it's not the kind of thing where you see ten violinists and chances are their technique will be a lot more similar than ten mandolin players, how you hold your wrist, how you hit the strings. It's still a work in progress, and the evidence is in the sound. Joe Brent: So, putting on my teacher hat for a minute, how do you make a recommendation to a student that you think will improve their playing without necessarily advocating your own personal way of playing? Barry Mitterhoff: I do show them different styles of holding your right hand and let them experiment for themselves to see which is the best for them. Sometimes I see students who, right from the get-go, need some kind of help in bracing their hand or in playing a little bit more precisely, other students right from the beginning can keep their hand off the top of it. I really let them try a number of different approaches. I stress the fact that I don't necessarily want my students to play exactly like me. Although, I do stress keeping your hand relaxed, and I think because of my background in bluegrass, I also stress a pretty fluid wrist and forearm. Joe Brent: Well, Barry, it's always a pleasure to talk with you, and I really appreciate you making the time to answer our questions, thank you so much! 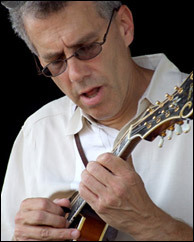 Barry with his Buckeye mandolin in concert with Jorma Kaukonen, guitar and Jack Casady, electric bass. Photo credit: Steve Pribut. Instrument: I play a Buckeye mandolin made by Pete Hart of Guysville, Ohio, I've been playing that for about three years now. I also played a Gibson F-5 for many years before that and I just thought I'd give this other one a chance. It's a lighter sound, and it's really beautifully intonated, and I just sort of fell in love with it as soon as I saw it. Builder Pete Hart's comments: "I started building mandolins in the winter of 1982-83 with Robert S. White coaching me all the way. I ended in doing about 75% of the work which was a good learning experience for me. "I started looking for the tone that I wanted after I heard Dempsey Young's Hutto. After building 2 to 3 mandolins, I felt that I had found that tone. I used European spruce exclusively until three years ago. That's when I tried Carpathian Spruce and I liked the results very well. I also learned on tone bar placement and top thickness, I could control the tone that I want. "When I built Barry's mandolin, I wanted to give him a little more of the tone of his 1942 Gibson F-5 but with a little more bass and depth. I feel I achieved that task and I am proud of that, of course, Barry helps that too. "I have built 2 mandolins out of Adirondack Spruce with good results but with a little harder tone. "I have my The Buckeye scripts cut commercially but my inlay patterns are all cut by me and by hand so each one may have a slight difference. I have my own fret pattern which I have had some nice comments from well-known artists on the intonation. "I use water stains applied by hand straight to the wood then I use epoxy as a base coat and filler topped with nitrocellulose lacquer. "I am probably like other builders; I'm always trying to make subtle changes to improve my tone and appearance to The Buckeye mandolin. "Barry is making some beautiful music with my mandolin and I'd like to close by saying how proud I am to have him playing it. Thank You." Strings: My strings are the GHS Bobby Osborne set, although I change out the D strings from a 24 to a 26. Picks: My favorite picks are these Gibson heavy black teardrop shaped picks, which unfortunately they've discontinued, so if any of your readers have some I'll buy them off them! I only have a handful left, and I really like them. I think I got the idea for these picks from Jethro Burns, who I had the privilege of taking a few lessons with back in the day. Microphone preferences: I use a combination of a McIntyre pickup and a DPA microphone. Sometimes when I'm playing in a situation where conditions are perfect and it's quiet, I can just use the DPA. I don't really have a mic preference in the studio - I do like AKG mics. Great article. Bob Applebaum was also my first mandolin teacher. However, I play nothing like Barry! I had so much fun watching Barry and Frank Sollivan play with each other after the Philly Folk Fest last year. They looked like they were having a ball. Great interview. Thanks! Frank on left and Barry. Kudos to all involved. Really enjoyed reading this. I attended two lessons with Barry last year at Kaufman's Kamp and I can state that he is also a very good teacher. Excellent interview! My one disappointment is the lack of any talk about Bottle Hill, which is the first band I came to know Barry in. I played "Harolds Super Service" in many a BG band back in the day, learned from Bottle Hill, a really top notch band. What an interview. What an interviewee! Thank you so much. Noting the anniversary of this interview published in 2012, put together for us by Joe Brent.